Admitted and Ready to Launch Your Life? Join us on campus, online or around the country for one of our upcoming admitted student events. The personal is powerful at Drew, so we give you the freedom to decide what you’d like to experience. Attend a class, have lunch with a student, learn about study abroad or internships—even catch an athletic event if the Rangers are on the field. If you are into science, check out our state-of-the art labs and chat with professors who love to mentor students. Or are the arts more to your liking? Take in a performance and see a student gallery show. Whatever you are interested in, we can help you create a day that’s right for you. Each date is a different topic. From the comfort of your own home, join us for an admitted student webcast about Drew. We will be having a series of live webcasts on various topics like: student life outside the classroom, financial aid, science & research, and more. These sessions will give you an opportunity to ask questions, interact with other admitted students in your neck of the woods (or around the world), and learn what to expect from life in the Forest. Come See The Forest For Yourself. 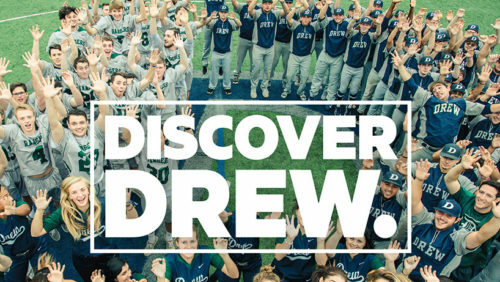 Join us on campus and discover Drew for yourself and find out how you'll Launch Your Life here. No mega open houses here— our more intimate Discover Drew Days, allow you to spend just a few hours “in the forest” and hear from current students, take a tour and meet faculty members who could become your real-life Yoda. We strongly recommend a personal interview. Beyond your application, recommendations and transcripts, a one-on-one admissions interview allows us to learn more about you, your passions and discuss how Drew may be the right choice for you. 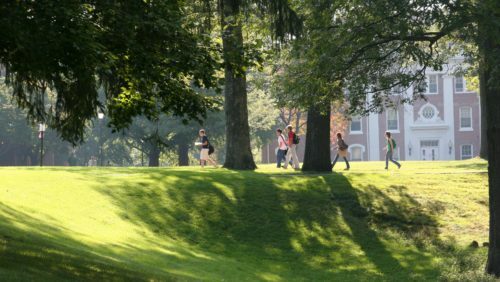 An interview will not only enhance chances for admission, but also for the Baldwin Honors, Asbury, Presidential or Dean’s academic merit scholarships as well as for the Civic Engagement Scholarship. Selected candidates for the 7-year dual degree BA/MD program will be invited to participate in a required admissions interview. We’d love to see you in person for your interview (and show you around while you’re here), so we hope you’ll make the trip to campus. We know that for some, coming to campus is simply not practical. That’s why we have our network of alumni, admissions staff and current students ready to interview online via Zoom no matter where you are in the world. There’s no substitute for the real thing; come for a tour and see Drew’s beauty and feel its energy. Hour-long student-led campus tours depart from Wesley House. Plan to arrive 15 minutes early to sign in. If special assistance is necessary, we ask that you contact us at least one week before your scheduled visit. Information sessions give prospective students and parents the opportunity to meet with admission counselors, explore our programs, learn about admission and enrollment procedures and ask questions. Tours are offered Monday–Thursday at 11 a.m. and 2 p.m. & Friday at 11 a.m. A brief information session will be held prior to each tour. Tours may not be offered on some holidays and open house dates. Academic Day Visits give high school seniors an inside look at what it is like to be a student at Drew. Typically, students sit in on one or two classes. Our admissions staff will work with faculty to select courses that best match your academic interests. During the visit there are also opportunities to have lunch with current students and take a campus tour. If you have questions about the type of visit that may be best for you, please call us at 973-408-DREW and we are happy to assist you. MEET with a transfer admissions counselor. GET your transfer credits and/or application evaluated. LEARN whether you qualify for scholarships worth up to $20,000. TOUR 11 a.m. or 2 p.m.
Drew Admissions will also be crisscrossing the country and traveling around the world to meet you in your neighborhood. You’ll have several opportunities to meet your admissions counselor, current students, faculty or alumni. Let us know if you'd like to visit the Caspersen School of Graduate Studies or Drew Theological School. We'll be happy to help you plan your day. Sessions will take place on Zoom. A link will be provided. Thursday, May 9 | 12 p.m. or 6 p.m. Learn about Drew’s new affordable tuition rate for educators. We’ve reset tuition from $1,200 to $800 per credit for our education programs. Educators are eligible for special scholarships in addition to the lower tuition rate! Tuesday, May 21 | 6 p.m. Learn about our accelerated and part-time degree options. Find out if you could qualify for a GMAT/GRE waiver. Wednesday, May 22 | 6 p.m. Learn about our accelerated, full-time, and part-time degree options. Tuesday, April 16 | 7:30 p.m.
Daniel Kurtzer, Former Ambassador to Egypt and Israel will speak on the topic of Camp David: 40 Years of Israeli-Egyptian Peace. Save the date for this conference. Publishing in Color conferences are intended to help overcome the fact that in today’s spiritual publishing industry several groups are under-represented. Drew is easily accessible by car from all directions. Plot your course today! Launch—our one-of-a-kind, leading-edge path to a degree—syncs career development with rigorous academics and powerful community. Can't be here in person? Our Virtual Tour will give you a glimpse of The Forest. Student-led group tours are available to high schools, community groups and organizations of 10 to 30 students who are high school seniors, juniors or in the spring of their sophomore years. • Reservation is required at least two (2) weeks in advance. • Reservation is confirmed when you receive notice from the Office of College Admissions. • Group size limit is 30, not including chaperones. • All tours are walking tours. • Groups arriving more than 30 minutes late can not be guaranteed a tour. • If inclement weather is predicted, please bring appropriate attire and gear (e.g., umbrellas). • If special assistance is necessary, please let us know immediately.